There are two types of macular degeneration: dry and wet. Approximately 85% of macular degeneration cases are the dry type. Patients with the dry form may have good central vision (20/40 or better) but limitations can still occur. 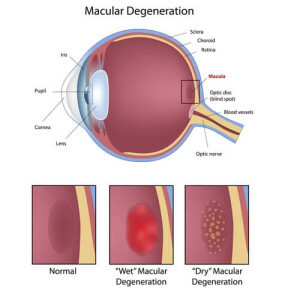 In the dry type of macular degeneration, the deterioration of the retina is due in part to the formation of small yellow deposits, called drusen, under the macula. This leads to thinning and drying out of the macula, which causes it to lose its function. The amount of central vision loss is directly related to the location and amount of retinal thinning caused by the drusen. This form of macular degeneration is much more common and tends to progress slower than the wet type. However, a certain percentage of the dry type of macular degeneration turns to wet with the passage of time. There is no known cure for the dry type of macular degeneration. Patient may see: Center vision may appear blurry because parts of the macula have begun to die, leaving blank spots in vision. Straight lines may look wavy. Side or “peripheral” vision is rarely affected. Approximately 15% of macular degeneration cases are the wet type. In this type of macular degeneration, abnormal blood vessels grow under the retina and macula. These new blood vessels can bleed and leak fluid, which will cause the macula to bulge or lift up, distorting the central vision. Under circumstances like these, vision loss can be rapid and severe. With Wet Macular Degeneration, the patient may see a dark spot in the center of their vision because of blood or fluid under the macula. Straight lines may look wavy because the macula is no longer smooth. Side vision is rarely affected. Yearly eye examinations are very important for patients at high risk. Research suggests that antioxidant vitamins, A, C and E, may protect the macula from damage. AREDS study results (National Eye Institute) released in 2001, involving more than 3,600 people, found that supplementation with vitamins C and E, A and zinc reduced certain patients’ chance of progressing to advanced Macular Degeneration by about 28 percent. Dry AMD treatment includes preventative measures such as AREDS vitamins, fish oil supplementation, and the avoidance of smoking. EARLY DETECTION and treatment is the key for successful treatment. Garrett Eye employs the use of Spectral Domain OCT and Fluorescein Angiography to help determine the proper diagnosis and treatment.